Summer blockbuster season wouldn’t be complete without some Michael Bay-produced/directed ‘splosion-filled action fest. Furthermore, it just wouldn’t be a summer blockbuster without scads of licensed toys, backpacks, and video games. 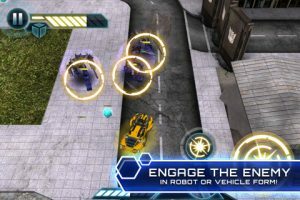 Electronic Arts is doing the honors here by bringing Transformers: Dark of the Moon to iOS platforms. 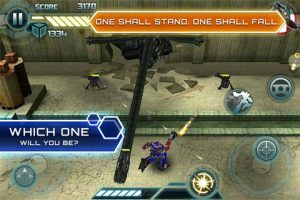 While the game does its best to bring much of the same visceral appeal of the film series, with tons of weapons, explosions, and giant-robot action, it is unfortunately bogged down by incessant dialog and text, and clunky controls brought on as a consequence of the touch-screen buttons. For under three dollars, the game is certainly priced right, but gameplay-wise, it never quite feels right. In Transformers: Dark of the Moon, you take on the role of Optimus Prime. Most levels consist of simple Point-A-to-Point-B exercises, blasting through scores of Decepticons along the way. Controls are handled, unfortunately, via on-screen buttons, which not only take up a lot of real estate on the small iPhone screen, but also are placed in a somewhat haphazard manner. Gamers familiar with twin-stick controls on consoles know what to expect here: the left button moves Optimus Prime, while the right button shoots in whichever direction it’s aimed. However, while in close combat, simply tapping the right button will allow you to use a melee attack. In addition, there are other buttons that can be used contextually; sometimes for multi-targeting, sometimes for using special attacks, and sometimes for transforming. Because these buttons are only used when the corresponding option is available, and are spaced differently than the main two buttons, you’ll find yourself taking your eyes off the action to track them down with your thumb. 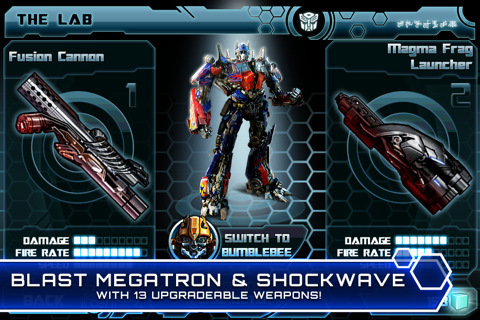 You’ll transform Optimus Prime into a semi from time-to-time during short vehicular combat sections. These were, quite frankly, the least enjoyable parts of the game. It’s understandable that cruising around in a semi should be a little clunky and sluggish, but the controls in these segments give a laggy, unresponsive sensation. Staying on course is nigh impossible, and you’ll rarely feel any precision in taking down enemies. The game is presented well enough, but the mountains of text-based dialog (which, admittedly, is optional) interrupts the action far too often. And the script manages to be even more ham-fisted and goofy than its source material. Nevertheless, Transformers: Dark of the Moon is not at all a “bad” game. 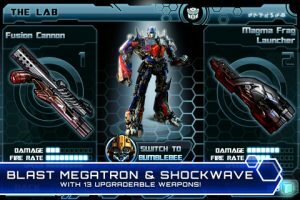 Running through gauntlets of Decepticons and blowing them up with your upgraded weapons is good, mindless fun, and fans of the film franchise will enjoy having their own portable game version to take with them everywhere they go. But it may not be long before the game begins to feel like an uninspired, quick movie cash-in. 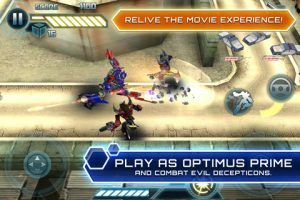 Bottom Line: Clunky controls and uninspired gameplay make Transformers: Dark of the Moon for iPhone little more than a quick cash-in. Transformers: Dark of the Moon is compatible with iPhone, iPod touch, and iPad. Requires iOS 3.0 or later.